August 8, 2013 -- Votesawant.org -- Seattle voters sent a clear message to an out-of-touch political establishment on August 6 that they are fed up with business as usual, and are looking for an alternative to corporate-pandering politicians like Richard Conlin. Kshama Sawant, who was recently written off by The Seattle Times as “too hard left for Seattle”, won a stunning 35% of the vote, a number that will likely rise as late ballots are counted. A majority of primary voters voted against 16-year Seattle City Council incumbent, Democrat Richard Conlin, who despite a massive fund-raising advantage and name recognition, received only 49%. Sawant and a second challenger to Conlin, Brian Carver, won the majority of the vote in the City Council Position 2 race. “Working people in Seattle have a clear political choice for a change. If you want to fight for an alternative to the status quo, join us in the struggle for a citywide $15/hour minimum wage, a major expansion of public transit by taxing Seattle’s millionaires, increased investment in affordable housing, and implementing rent control”, said Sawant. Ireland: What’s left after the ULA? Happier days before the Socialist Party and Socialist Workers Party abandoned the ULA. Click HERE for more on the United Left Alliance. April 29, 2013 – Links International Journal of Socialist Renewal -- This brief report intends to outline the situation within the Irish left following the slow implosion of the United Left Alliance (ULA). Re-elected socialist municipal councillor Steve Jolly. For more articles on socialists in municipal councils, click HERE. The Spark: So the Socialist Party retained its municipal council seat held by Stephen Jolly, and lost its council seat held by Anthony Main. Can you break that down a bit more? Mel Gregson: The campaign in Yarra was very successful with almost one in five voters across the city voting for us. We stood a team of five candidates, including current councillors Stephen Jolly and Anthony Main. (Left to right) Joe Higgins, Seamus Healy, Richard Boyd Barrett, Clare Daly and Joan Collins of the United Left Alliance hold a press conference calling for a "no" vote in the EU Fiscal Treaty referendum, outside the Labour Party headquarters. For more reports and discussion about the United Left Alliance in Ireland, click HERE. June 26, 2012 – Links International Journal of Socialist Renewal -- On May 31, the only country to get a vote on the European Fiscal Treaty – Ireland -- voted for it by 60% to 40%, with a turnout of 50% of eligible voters. Miriam Lord, political colour-writer for the Irish Times (June 2) had a front page article with a headline almost as big as the main news story headline. It proclaimed, “The nation gives one great big sigh of relief”. Certainly, the Irish elite was giving one great big sigh of relief after a hard-fought campaign. Road maps, dead ends and the search for fresh ground -- How can we build the socialist movement in the 21st century? December 2010 -- Cultural Logic, posted at Links International Journal of Socialist Renewal with Dan DiMaggio's permission -- For the past seven-plus years I have devoted much of my life to effort to build a socialist movement in the United States. As a member of one of the many tiny socialist groups on the US left, I have organised dozens of anti-war, labour solidarity, immigrant rights and other rallies and campaigns. I have toured the country to speak at college campuses about socialism. I have set up numerous study groups and conferences and written and edited hundreds of articles for socialist publications. Most people might say, “Dan, you’re crazy if you think that socialism can be achieved in a country like the United States!” But despite the challenges, I hope to continue doing this for the next 50 or so years. September 12, 2011 -- Green Left Weekly -- In the elections to the Scottish parliament in May 2003, the Scottish Socialist Party (SSP) polled just under a quarter of a million votes and won six seats. By any stretch of the imagination this was a remarkable achievement for a party well to the left of Labour. It was a beacon of hope and inspiration for socialists the world over. By 2011, the SSP’s vote had slumped to below 9000. It failed to regain any of the six seats it had lost in 2007. 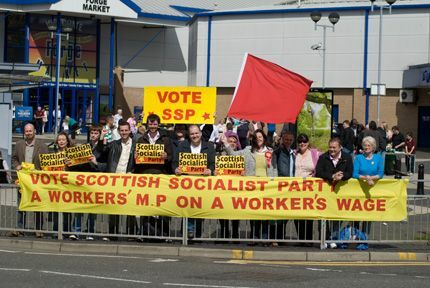 The single biggest factor in the SSP’s electoral demise was almost certainly the civil war and split that followed the scandal surrounding the SSP’s former convenor, Tommy Sheridan. January 16, 2011 -- United Left Alliance -- The challenge of the United Left Alliance to the right-wing consensus in Irish politics is strengthening rapidly. As of today, a total of 17 constituencies will be contested by 18 ULA candidates in the looming general election. As well as Tipperary South and West Waterford, 11 constituencies in Dublin, two in Cork, as well as Wexford and Limerick city, candidates have been nominated for Carlow/Kilkenny and Laois/Offaly. This means that almost 50% of Dáil [parliamentary] constituencies will have a left alternative to the establishment political parties. It is entirely possible that this number will be extended in the coming weeks but even at the current number, it is the first time in Irish politics that there was such a wide representation of principled left candidates presented to the electorate in a general election. Ivorians protest against food price increases in 2008. Jannuary 5, 2011 -- Democratic Socialist Movement (Nigeria) -- That the November 28, 2010, run-off election in the Ivory Coast has produced two presidents – Alassane Ouattara and Laurent Gbagbo – is not a surprise, though working people had expected the election to usher a return of peace. The country has been divided into two since the 2002 coup attempt and subsequent rebellion, with each half effectively having its own de facto government. The north is controlled by rebels, Forces Nouvelles (New Forces), while the south is under Gbagbo with the support of the armed forces and youth militia. Therefore, on this account and with the ethnocentric sentiment that has characterised Ivorian politics in the last two decades, it is natural that the results of the election from either half would be bitterly disputed by the party declared the loser of the contest. The United Left Alliance in Ireland: Is this the left unity we were hoping for? Richard Boyd Barrett from the People Before Profit Alliance and Joe Higgins MEP from the Socialist Party, during the launch of the new United Left Alliance, November 29, 2010. December 13, 2010 – Irish Left Review – Jodie Ginsberg, Reuters’ woman in Dublin, said on TV3’s Vincent Browne Tonight program on November 25, when asked for her impression of the situation in Ireland, “people are shell shocked”. November 17 video made by Workers' World Media, Cape Town. November 17, 2010 -- A militant factory occupation by South African metalworkers is about to enter its second month. On October 20, 2010, workers at the Mine Line/TAP Engineering factory in Krugersdorp, just outside Soweto, began the occupation to prevent the removal of machinery and other assets and to fight to save their jobs. The workers are demanding the state take over the factory, so that it can be reopened as a democratically run workers' cooperative. The workers are organised by the Metal and Electrical Workers Union of South Africa (MEWUSA), in which the Democratic Socialist Movement (DSM, the affiliate of the Committee for a Workers' International in South Africa) plays a leading role. June 9, 2009 -- Socialist Resistance/International Viewpoint -- There was a broad popular abstention in the European elections. Nearly 60% of voters did not vote. Because of this, only a deformed vision of the real relationship of forces in Europe is possible. But it confirms the crisis of legitimacy of the European Union and of the governing parties that implement their policies within this framework, writes François Sabado. 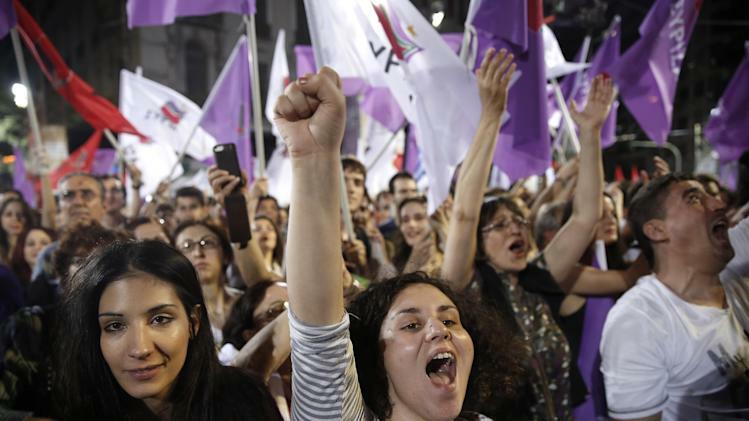 Other tendencies emerge, initially a rise of the right across Europe. The right won in the big countries where it governs: in Germany, France, Italy, Belgium, Holland, Poland, Austria and Hungary. In Bulgaria, Lithuania, Latvia, Slovenia and Cyprus, the parties of the right also came first. April 24, 2009 -- Voters who want an isolationist Britain will be spoiled for choice in the European elections on June 4th. On the far right, the BNP and UKIP both demand an independent Britain. Left of centre parties that want British withdrawal include Arthur Scargill’s Socialist Labour Parry and the NO2EU Yes To Democracy coalition. While these four parties promote British independence, the Free Scotland Party campaigns for an independent Scotland outside the European Union. What should be the attitude of Scottish socialists towards Europe? Should the left back British separatism? And does the NO2EU Yes To Democracy campaign represent a progressive step forward? Kola Ibrahim of the Democratic Socialist Movement of Nigeria looks at the legacy of Fidel Castro, the internationalisation of struggle and calls for ``working-class activists from Kenya to Venezuela to Georgia to Pakistan and the rest of the world'' to build a genuine working people's political platform. Last year I wrote a letter to Farooq Tariq, general secretary of the Labour Party Pakistan, responding to his request for our leadership's disagreements with the Committee for a Workers' International's view of Cuba. The letter took the form of an extended polemic against Socialist Party of England and Wales (SPEW) general secretary Peter Taaffe's 1982 pamphlet Cuba: Analysis of the Revolution. The letter was subsequently printed in The Activist for the information of DSP members. In June this year  the CWI published a book by Peter Taaffe replying to my letter to Comrade Tariq entitled Cuba: Socialism and Democracy.